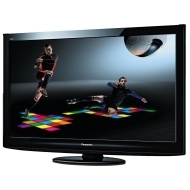 alaTest has collected and analyzed 706 reviews of Panasonic TX-P42G20E. The average rating for this product is 4.5/5, compared to an average rating of 4.6/5 for other products in the same category for all reviews. We analyzed user and expert ratings, product age and more factors. Compared to other products in the same category the Panasonic TX-P42G20E is awarded an overall alaScore™ of 89/100 = Very good quality. This Panasonic certainly has a lot going for it, not least great images, but it's expensive against its peers. Is that price justified? Panasonic gave its plasma TV range a timely boost last year with the introduction of new brightness-boosting, energy-saving, colour-enhancing NeoPDP technology. Panasonic’s Viera TX-P42G20B balances excellent picture quality with an amazing price, making it a deserving Best Buy winner. Panasonic have once again demonstrated that there is a good deal of mileage left in Plasma technology ..
Panasonic have once again demonstrated that there is a good deal of mileage left in Plasma technology. While Plasma aficionados will love this screen, the combination of sharper performance and good value will also appeal to all. Very easy to use menu system and excellent picture. So many facilities, not managed to use them all yet e.g. WiFi and networking. Not found any so far. Excellent image quality and decent sound. Always boots up looking for Freesat channels before picking up feed from Sky+HD.